Delivery is free worldwide, we ship same-day whenever possible and all payments are guaranteed and protected by PayPal. EnGov is a time proven cure that contains no banned or harmful substances. All its ingredients have been passed as safe for use in Brazil and around the world. It’s been around since the 1960s and is produced by one of Brazil’s largest manufacturers of medicinal products Hypermarcas. EnGov goes way beyond the usual next day ‘pick me up’ you’ll find in your local chemist. It’s been tested, developed and improved for over 50 years and now targets every way alcohol can affect your body. • Detox and Body Flush – Prevents long term damage to your liver and kidneys. Stops you feeling grotty, weak and effectively re-energises your body’s vital organs. • Neutralising Antacids – Mineral salts reduce your stomach’s acidity levels, settle your tummy and prevent excess gas or diarrhiea. • Stops the Shakes – Vitamins B, C and E help boost your body’s natural immune system, flush out your blood and detox. • Hydrates and Re-Balances – Alcohol literally dries you out, resulting in an aching head and body. 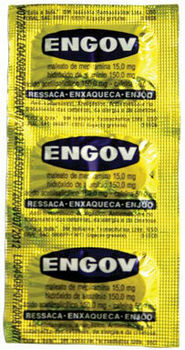 EnGov prevents dehydration and restores your body’s natural equilibrium. • Prevents Nausea – Powerful Anti-Histamines usually used to treat flu and allergy calm your stomach and stop the waves of nausea. • Reduces Drowsiness – Vitamin C and Caffeine give you the energy boost you need to carry on as normal, no matter what you were drinking last night.